Worldwide, but more species present in tropical than in temperate areas. Predators of bee and wasp eggs and larvae. Jennings, J. T. & Austin, A. D. 2004. 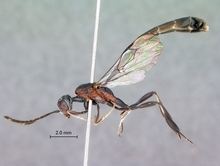 Biology and host relationships of aulacid and gasteruptiid wasps (Hymenoptera: Evanioidea): a review. pp. 187-215. In Rajmohana, K., Sudheer, K., Girish Kumar, P., & Santhosh, S. (Eds.) Perspectives on Biosystematics and Biodiversity. University of Calicut, Kerala, India. Mason, W.R.M. 1993. Superfamilies Evanioidea, Stephanoidea, Megalyroidea and Trigonalyoidea (pp. 510-520). In GOULET, H. & HUBER, J. (eds). Hymenoptera of the World: an identification guide to families. Research Branch, Agriculture Canada, Ottawa, Canada, 668 pp. Pasteels, J.J. 1955. Contributions à l'etude de la faune entomologique du Ruanda-Urundi (Mission P. Basilewsky 1953). Hymenoptera Argidae, Tenthredinidae et Gasteruptiidae. Annales du Musee Royal du Congo Belge 40: 370-75. Pasteels, J.J. 1956. Révision du genre Gasteruption (Hymenoptera, Evanoidea, Gasteruptionidae) I. Espèces de l'Afrique noire. Annales du Musee Royal du Congo Belge 50: 1-91. Pasteels, J.J. 1956. Hymenoptera : Gasteruptionidae. pp. 483-484. In Hanstrom, B., Brinck, P. and Rudebeck, G. (Eds. ), South African Animal Life. Results of the Lund University Expedition in 1950-1951 Vol 6. (Alnqvist and Wiksell: Stockholm). Pasteels, J.J. 1958. Trois nouveaux Gasteruption Hymenoptera, Evanoidea, Gasteruptionidae) d'Afrique occidentale. Bulletin et Annales de la Société Royale Entomologique de Belgique 94: 125-128. Pasteels, J.J. 1962. Espèces peu connues on nouvelles du genrs Gasteruption, en provenance de l'Afrique noire (Hymenoptera, Evanoidea). Bulletin et Annales de la Société Royale Entomologique de Belgique 98: 49-60. Photograph of living specimen © Vida van der Walt (Pretoria).